A last minute dessert suggestion before Thanksgiving. Poach pear sections in a lemony-brown sugar liquid and add pomegranate seeds for a pleasing crunch to counterpoint the soft, sweet pears. 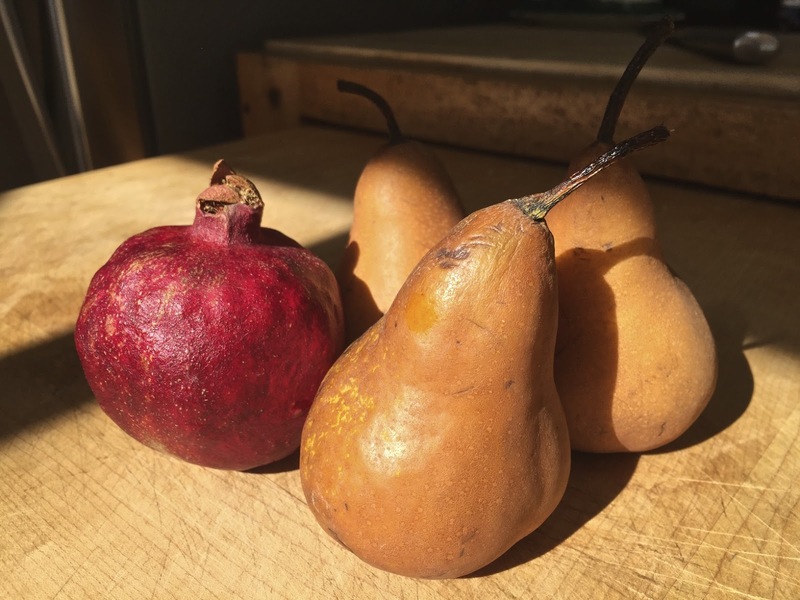 Serve the pears as a small plate dessert or as a topping for ice cream or yogurt. 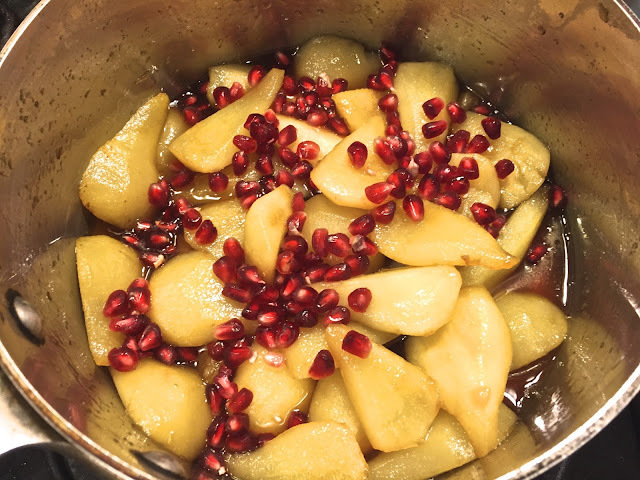 For our meal, I'll make whipped cream to put on top of a bowl with the pears and pomegranates with a few tablespoons of the poaching liquid. Peel the pears. Discard the peels and the stems. 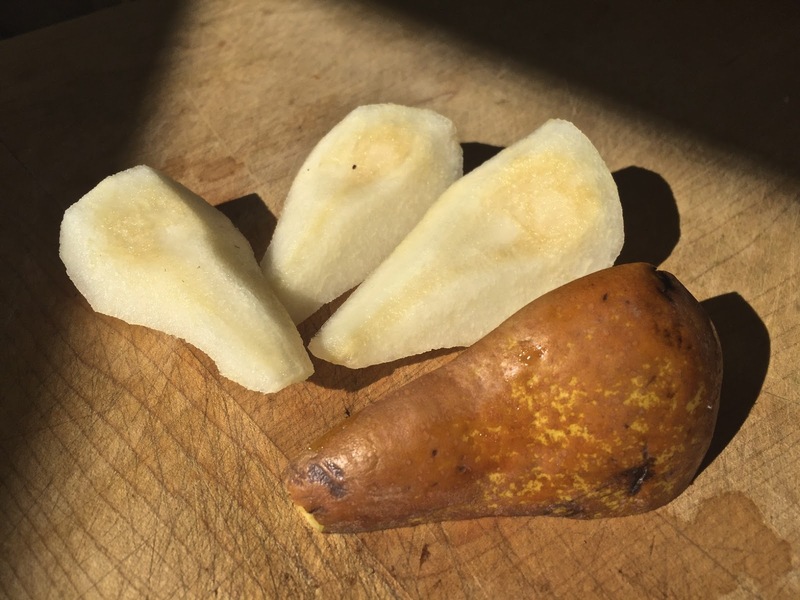 Cut each pear length-wise into four pieces. Cut and discard the inner stem and seeds. Set aside. In a large saucepan, over a medium flame, heat the golden brown sugar and lemon juice. Stir and heat until the sugar dissolves. Add the pear sections to the saucepan. Stir well to coat with the sugar mixture. Cover. Check ever 2 minutes to stir the pears so they cook evenly and are well coated with the poaching liquid. After 5 minutes, remove the lid and set aside. Add the pomegranate seeds and stir well. 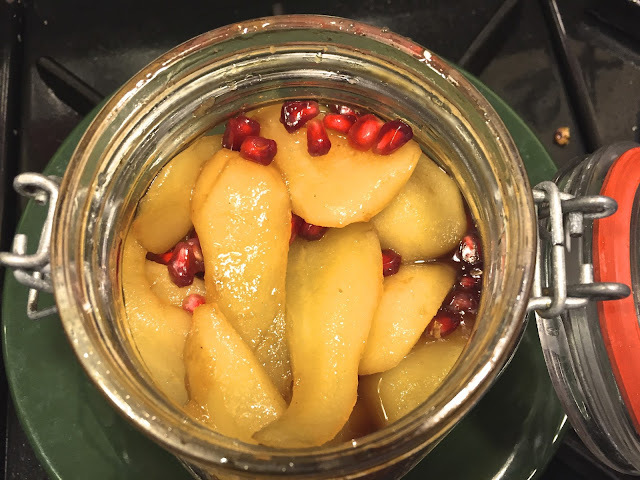 If making the pears a day or two ahead, transfer the pears, pomegranates and poaching liquid to an air tight container and refrigerate. The pears can be served cold, hot or at room temperature, depending on taste. Add 1 tablespoon golden raisins to the poaching liquid and simmer 5 minutes before adding the pears. 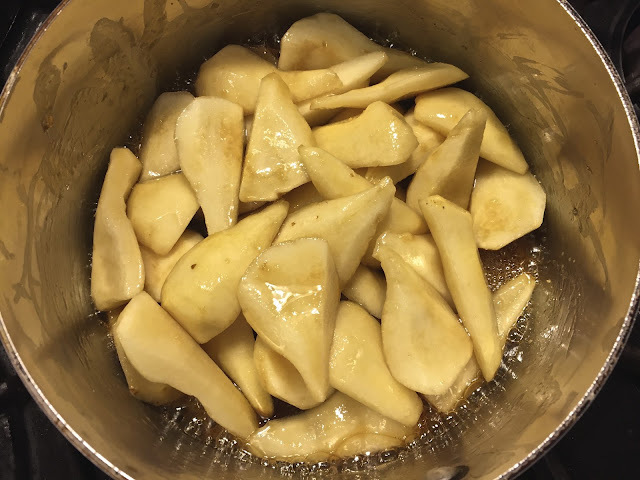 Add 1 teaspoon finely chopped candied ginger to the poaching liquid along with the pears.